You might also ask whats so new or different in controlling a robot by mobile phone? You must watch the video and see how accurately the leg movements are controlled, how the robot dances and moves. 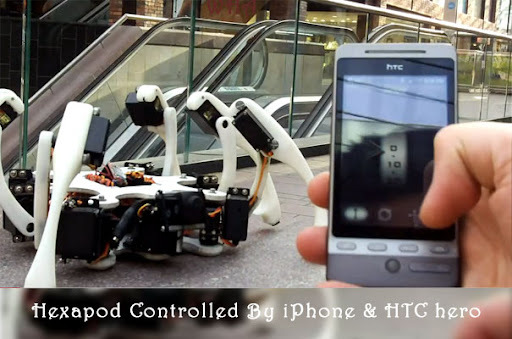 When it wasn't enough, Stephen shows Hexapod playing a PS3 game being controlled by iOS and Android OS phones. The Android Kinamatic App communicates via a bluetooth connection. Earlier he needed a computer to route, now he routes iphod touch via Droid phone with his self built Android Server App. I hope you enjoyed it and in future we will be seeing more devices being controlled by these two powerful iOS & Android OS. Awesome video :) loved it. One of my last projects was a 4x4 differential drone, built from scratch, remotely controlled via Bluetooth using an Android smartphone. The data is sent back to the Android device, via bluetooth. thanks for letting us know about your project.